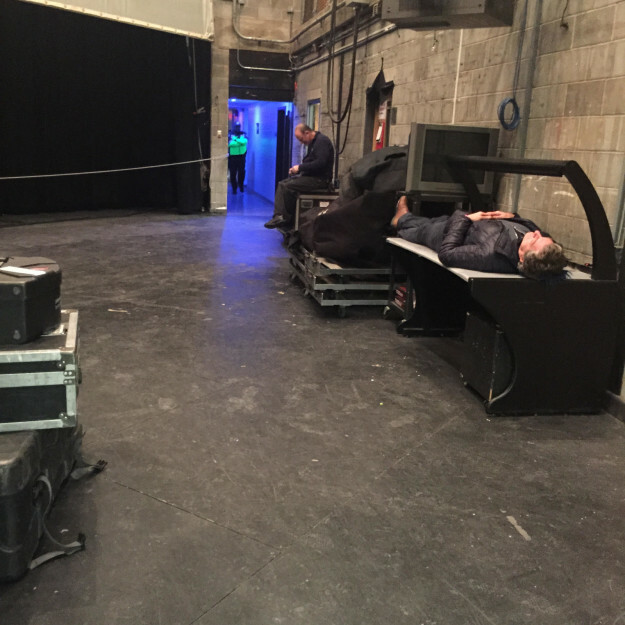 From sleeping stagehand guy to that crazy fan – how’d they get backstage AGAIN?? There is always minimum one napper who finds the most random uncomfortable looking spot to drift off. Get it girl. Usually they’re the tour or production manager. Running on sleep, wears gym shorts and vans. Ready to let his anger out the first chance he gets. This person tries SO hard and worries about every detail. When the tour manager talks down to them you feel SO bad, but have to remind them it’s a concert and things are bound to go wrong. They always have cool hats on and demand more meet and greets. They also love to stand in big groups in very inconvenient places. Radio people can to talk their way into anything! Just another day at work for them! They always show up late, immediately ask about food upon arrival, and generally hide in their green rooms or tour bus until they have to take stage. Another day, another dollar. This person works shows because they love their job. The constant excitement of dealing with day of show, seeing live music and hard their work pay off. This person makes day of show a blast for everyone! Social media is one of the best ways to promote your event. It can be free, or you can pay for ads to target specific audiences. Coming up with different posts, images, info, and tips will help you get noticed. Remember that each platform is different, and should be treated as such. Instagram can be a great tool. It is important to remember that 60% of customers use pictures to decide on a product. 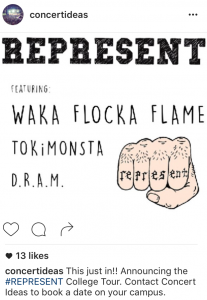 Instagram is a great place to share event posters, and images of the artists who will be at your event. Hash tag, location tags, and tagging accounts that relate to your event is extremely important. 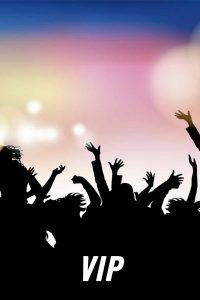 People can find and share your event simply because they find your post from your tag usage. Don’t shy away from using as many hash tags as you want. The more there are, the more people will see your post. You can also do paid Instagram ads, but these tend to be less successful than FaceBook ads. Make sure everyone who is a part of your event group re-posts and tags the account associated with the event. Unlike FaceBook, Instagram can be used for marketing as much as you want – the more the merrier! Twitter is a fast paced, constant content is key. Twitter is one of the most important social media platforms, and is a can be a great way to target a younger audience. Consistent and constant posting is key. Make sure to keep a constant mix of writing, re-posting, and sharing. Twitter gives the potential customer the feeling that they are receiving special attention, in real time. Consistent engagement and interaction with the Twitter community about your event, and even general topics relating to your event is key. With FaceBook, continuous posting and interaction with followers is the most important. Do not post more than once a day. Unlike Twitter and Instagram, if you post more than once a day you run the risk of your post getting lost in the mix and going unseen. Paid advertisement will guarantee your posts do not go unseen. FaceBook also has one of the better systems for targeting the audience you need. Similar to Instagram, have anyone and everyone that you can respond to and share your event and posts. The more people interact with posts, the more likely other people not associated with the event will see your event. 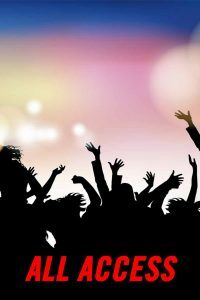 Snapchat is one of the newer frontiers of event marketing. Marketing on Snapchat can be best day of event. Simply because it is not a place that people go to find out about shows. You can always try to have your artists do a shoutout on Snapchat about your event (keep in mind that artists will rarely agree to this), or have folks associated with your event snap event posters. It can feel like homework, but remember social media is just that – social! Don’t shy away from posting funny articles or GIFs. Keep in mind your customer profile and what information matters to them. Who are you trying to get to you event and what are they interested in? The key thing to remember is to be creative and keep up with your posts. Everything you need to know about passes day of show! Credentials are an important part of keeping people organized and safe at your big event. Large touring parties will carry their own that they use. However, you still need to have them for your team. Make sure to limit the passes and types of passes that you give out day of show. You never want to have too many people backstage backstage day of show! It is always a good idea to print out pass info sheets (see below example). You can post them up day of show and give them to security. Everyone will be clear day of show what each pass means. One common mistake, is not printing out enough. Running out of passes day of show means you will have to improvise a solution and then clear it with the band, security, and your team. Not something you want to deal with during your big event! NEED CREDENTIALS FOR YOUR EVENT? Check out the below credential layout examples and feel free to use them. Print, laminate, hole punch, and attach a string or lanyard! HOW MANY TYPES OF PASSES DO I NEED? 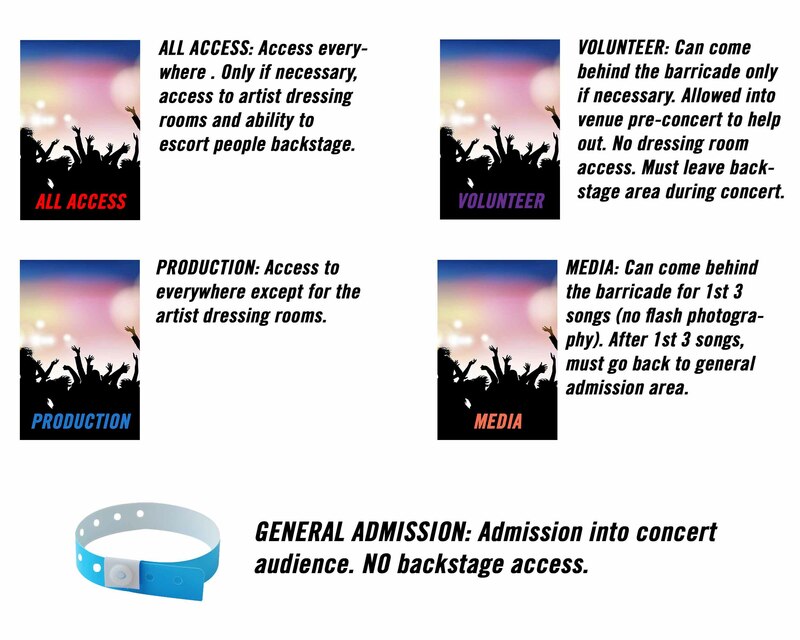 Every event is different, but you don’t necessarily need a credential for every type of person at a concert. Here’s a quick guide to getting away with printing as little as possible! It’t that time of year again! 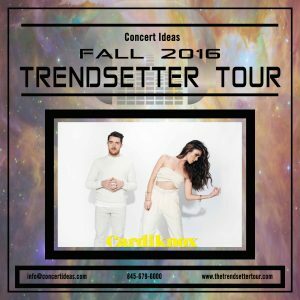 We’re super psyched to announce that Cardinknox will be headlining the fall 2016 Trendetter Tour. With their perfect catchy songs, and rising popularity they are the perfect fit for the tour. Contact us if you want to bring them to your campus this fall!